A reader of LoyaltyLobby sent me this link for instant Silver status with Hilton HHonors that comes with a fast track offer for Gold just after 4 stays within 90 days of signing up. You can access this offer here. EDIT: (April 2) Hilton has now retired this promotion and this fast track offer (other fast track offers are still available – see below) with instant Silver status is no longer available. Hilton must have forgotten this offer altogether as the terms and conditions indicate that this offer would be valid only until September 30, 2011. All you need to do is to plug in your Hilton HHonors number and the PIN and it will then prompt the very basic looking web page with a message “Promotion Successfully Dropped”. The account correctly indicated the Silver status immediately. There is a mileage bonus for having 5 stays after signing up, but I am not sure if it is going to work. There are other fast track offers as well, but they don’t come with instant Silver status. There is this MVP offer (access here) and offer for Carlson Wagonlit customer (access here). Both of these offers are for gold status after just 4 stays. Even after the devaluation of Hilton HHonors points last week, the Hilton HHonors Gold status is very worthwhile and only requires 4 stays during 90 day period. If you have some Hilton family of hotels stays coming up, it doesn’t hurt to sign up for one of these offers and collect the Gold status. Offer available only for select Mileage Plus Premier members and is not transferable. Offer ends September 30, 2011. 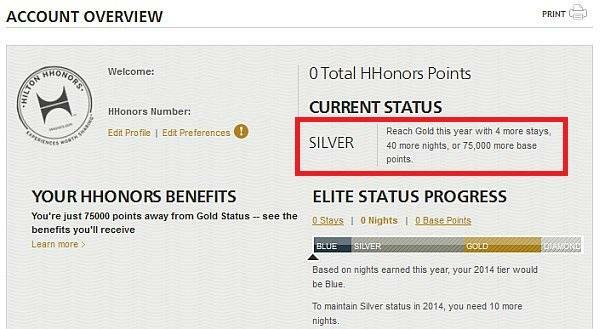 Member must first register at HHonors.com/mileagepluselite prior to completing any qualifying stays to be eligible. All Mileage Plus terms and conditions apply. Hilton HHonors™ membership, earning of Points & Miles™, and redemption of points are subject to HHonors Terms and Conditions . ©2010 Hilton Worldwide.